The migration of the Monarch butterfly is an absolutely breathtaking event of nature. Generations of these butterflies migrate to and from Canada and Mexico, often taking years to complete the migration process. Somehow, each generation knows the journey it must take to arrive and then send other generations back to Mexico. But a problem has been seen in the last couple of years when the population of Monarch butterflies arriving in Mexico for their winter season dropped seventy five percent. The arrival of the Monarch butterfly to Mexico is something to behold. Millions and millions of the butterflies cover the pine and fir trees. These are the trees that the Monarchs prefer. If you are witness to this miracle, you realize that the trees themselves are almost not visible but are instead covered by the glorious colors of the Monarchs themselves. The Monarchs are affixed to the trees, gently moving, so that the trees seem to have an additional rustle of life. In the last two years, scientists that monitor the Monarch butterfly migration have become quite alarmed. They have been monitoring the Monarch since 1993 and discovered that the population is decreasing at an astounding rate. Some scientists dismiss the alarm, stating that the variations in the population occur in a cyclical method. This has occurred over the years of record keeping, with the population rebounding the following year. Other scientists are not so sure. The forest areas of Mexico have undergone some rather severe deforestation, thereby reducing the quantity of trees that the Monarch prefers and the deforestation is continuing. A survey conducted by the World Wildlife Fund, private funding and the National Commission of Protected Areas in Mexico, must measure the Monarch butterfly coverage based on the quantity of acres/hectares. This is required since the butterflies hang together and they cannot be counted individually. Something to note is that this year, approximately eighteen percent of the butterflies migrated to areas that were outside of the standard protected areas. There is a request to expand the protected areas, however, most of this land is currently owned by private farmers. Another factor that is in play is that the Monarch butterfly depends largely on the milkweed plant for feeding. Much of the milkweed has been destroyed and replaced in the local farming process. This process includes the spraying of herbicides and pesticides, which have may also have harmful effects on the Monarch’s existence. 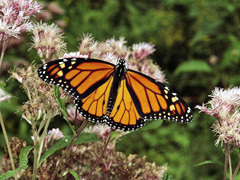 Since Monarch butterflies pass through many areas of the United States, additional assistance has been requested from a variety of experts in the states where the Monarchs land. The migratory path includes the State of Texas, where they witnessed some devastating effects due to the extreme drought that afflicted the state. The combination of the drought with the massive wildfires wreaked havoc on the state. This removed the ability for the Monarch to thrive and continue their journey to Mexico. Whether from deforestation, severe weather or just a regular cyclical change, there is a definite problem with part of Mother Nature’s balance. These are often signals of greater problems. Scientists and world organizations will continue to monitor the situation and we hope that we will once again see resurgence in the Monarch butterfly population. Posted on April 20th under Global Ecology.